My topic today is Thomas Jefferson’s Legacy to the Youth of America – and for that matter, of the world. 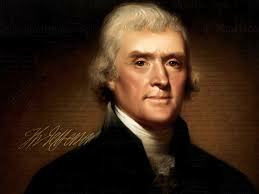 And that combination of genius, wisdom, vision, curiosity, political skill, and elegance of literary style is why Thomas Jefferson, of the many famous and accomplished Americans, remains a compelling figure not only in our country, but throughout the world, wherever people yearn for independence, liberty and self-government. In the brief time we have together, I can only hope to spark your interest in learning more about this remarkable man. So let me give you a brief survey of his life, and especially of the political principles that he so brilliantly enunciated. Two hundred and seventy years ago next Saturday Thomas Jefferson was born in a rude frontier house in Albemarle County, Virginia. At the end of his long and extraordinarily productive life – he died at his beloved Monticello, near Charlottesville, Virginia, at the age of 83 – Jefferson asked that only three things be engraved upon his tombstone: that he authored the Declaration of American Independence, secured adoption of the Virginia Statute of Religious Liberty, and founded the University of Virginia. Had Jefferson favored a larger monument, it might also have noted that he was Governor of Virginia, Ambassador to France, Secretary of State, Vice President, and President of the United States. But merely reciting his public offices falls far short of capturing the true genius of this man. From his youth Jefferson devoured books and ideas – and learned the practical arts of agriculture, architecture, commerce, and science. He could have discussed history with the great historians Tacitus, Herodotus or Gibbon. On any point of law he could have held his own with Lord Coke or Sir William Blackstone. A visitor who spoke to him of geography would have found it easy to believe that Jefferson had traveled with John Cabot to the northern seas or with Captain Cook to the South Pacific. In natural science his observations would have stimulated a Newton or a Darwin. He loved the poetry of Homer and Shakespeare, Moliere and Dante. And he could have discussed those matters not only in English, but also in Latin, Greek, Italian, Spanish and French. A perusal of his library showed that he had also shown an interest in German, Arabic, Welsh, Gaelic, and especially Native American tongues. I agree that it’s possible to extract from Jefferson’s vast outpouring a few phrases, shorn of their context, to support a wide range of today’s political arguments. I want to assure you that in selecting the following ten key points of Jefferson’s thought today, I am doing justice to him and to the historical record, and taking care not to warp his thought into the service of any current ideology. That said, let me select and briefly illustrate my “top ten” from Jefferson’s life and works, as his legacy to the statesmen and citizens of today and tomorrow. Number One: The importance of character, decency, integrity and honor to the preservation of a free republic. Number Two: Faith in the Common Man: Looking back two years before his death, Jefferson summarized his lifelong view when he wrote “Men by their constitutions are naturally divided into two parties. First, those who fear and distrust the people, and wish to draw all powers from them into the hands of the higher classes. Secondly, those who identify themselves with the people, having confidence in them, and cherish and consider them as the most honest and safe, though not the most wise, depository of the public interests”. Jefferson obviously identified with this second group. He had a revulsion against the Hamiltonian ideal of government by the rich, well born and well connected – although he himself largely fit that description, dwelling in some elegance at his mountaintop estate of Monticello. But a key distinction was that the Virginia planters derived their prominence from making the land productive – albeit with the help of a large workforce of slaves. By contrast, the rising class of the Federalist Party’s leaders waxed rich and powerful from commerce, finance, and trading things of value, rather than creating them. The Hamiltonian leaders were often eager to manipulate government favors to produce their riches, rather than earn them through honest work, and approved of the increase of public debt as a way of attaching more firmly the financial class – who Jefferson called the stock jobbers – to the fortunes of the government. Jefferson was convinced that self-government could be achieved and maintained only if the great bulk of governmental functions could be exercised close to the people, under their watchful eyes. “What has destroyed liberty and the rights of man in every government which has ever existed under the sun?”, he inquired. “The generalizing and concentrating all cares into one body.” To this end he advocated the idea of the “ward republic”, where every citizen could take pride in participating in the ennobling process of self-government. Only such a system, he believed, could breed the virtuous, independent citizen, and become a bulwark against the rise of despotism. That thought leads to Number Three: The Threat of Corruption. Today we think of corruption as embezzling town funds or selling one’s vote for money. That has always been true, but in Jefferson’s day the term had a far broader meaning. To political theorists dating back to Polybius, corruption meant the deterioration of a desirable government into a far worse one. The 17th and 18th century English political theorists viewed this trend as inevitable – unless it could be consciously prevented by wise design of institutions. That was the point of James Harrington’s Oceana, published in 1656. It proposed a means of maintaining a healthy balance among interests, leading to an “immortal republic” of liberty. I’ll return to that later on. But he was appalled at the scheming of many leaders of those interests to enrich themselves through government benefits, protection, and subsidies. One can only imagine how Jefferson would have thundered against the business and financial bailouts of the past four years in Washington. Number Four: Private Property Ownership. From the first beginnings of his political thought and his law practice, Jefferson affirmed and set out to implement James Harrington’s 17th century prescription for an immortal republic. Like everyone else among the Founders, Jefferson firmly believed in private property. But, as with Harrington, there was more. Private property not only needed to be secured against confiscation and invasion, but it must also be widely distributed among the people. Independent, self-reliant proprietors, constituting both the electorate and the militia, would act always to preserve their rights and liberties against the usurpations of a corrupt central power. His early law practice focused on challenging colonial land grants to the King’s cronies, to open up those western lands to actual settlers. One of his greatest legislative achievements was the Virginia law, coauthored with Madison, to terminate primogeniture and entail in property law. That meant that estates would pass to all the heirs, not just the eldest male, and the property could be exchanged outside of the family, creating greater opportunities for the industrious. Jefferson looked with admiration on our self-governing New England towns, even when they vocally rejected his 1807 embargo against trade with the British. He meant what he said. In his first presidential budget he devoted seventy percent of the Federal government’s revenues to that end. Thanks to his strict fiscal discipline, and despite the costs of the Louisiana Purchase and the War of 1812, the national debt was in fact extinguished in 1835. He also proposed a constitutional amendment prohibiting the Federal government from issuing debt. Alas, it wasn’t seriously considered. Our national debt today is approaching $17 trillion dollars, greater than our national production of goods and services. Maybe we should have paid Jefferson more attention. Number 7: Respect the Constitution. Jefferson passionately believed that, after the Declaration, the Constitution of 1787, augmented by the Bill of Rights, was America’s splendid charter of liberty. The Constitution contained the rules of government, and in particular specified what powers the national government would have – and where the reach of government power ended. The Constitution is the operating manual for the republic. If new problems and new situations suggest amending it – then use the process specified to make the needed change. But, he would say, never, never, stretch, distort, undermine or amend the Constitution by construction. Education brought not only understanding of the past and of the great questions of natural law and ethical behavior, but the opening of new opportunities for the arts of agriculture, manufacturing, transportation, and the like. In his early years, Jefferson advocated free public education for all boys up to what we could call third grade, to establish literacy and basic knowledge. After that, he envisioned a progressive weeding out of the less capable, as boys advanced to, eventually, higher education, leading to an aristocracy not of birth, breeding, or riches, but of virtue and talent. Regrettably, the 18th century was not much interested in the education of girls, but I have no doubt that Jefferson would enthusiastically approve of equal opportunity in our day. The great work of his life after the leaving the presidency, of course, was the founding the University of Virginia. It would, he believed, become a fine example for educating the people for leadership. Number Nine: The Advancement of Liberty. Infused throughout Jefferson’s thinking was the preeminent value, the goal of all sound public policy, the preservation and advancement of individual liberty. Property promoted liberty and free institutions; therefore it was essential that the majority of the voters owned property. Education meant little without the liberty of thought and inquiry. The accumulation of government debt stole the liberty of future generations to make their own decisions. Taxation, beyond some minimal level, took away the liberty of the taxpayer to best apply his just earnings to his own benefit. To every question of public policy, the first response must be: will it advance and expand the liberty of the individual – or undermine and restrict it? That concern is certainly much with us today, as governments become ever larger and more intrusive. Number Ten: America as a Shining Example for the World. In his day, Jefferson shared George Washington’s aversion to foreign entanglements. Over his lifetime, he saw much happen that ran against his deeply held principles, and threatened the liberty of the people. But Jefferson never abandoned his optimism. Until his dying day – on the fiftieth anniversary of the Fourth of July – he gloried in the prospect of the grand American experiment, brought forth by enlightened statesmen on a new continent with limitless resources and boundless prospects. As inspirational and visionary as he was, and as committed as he was to advancing the ideal of human liberty, Jefferson alas could never find a practical way to eradicate the curse of human slavery, about which he anguished throughout his life. He was also prone to some human weaknesses, such as deviousness in political behavior, an occasional flirtation with censorship, and poorly managing his own finances. But the great principles of his faith – liberty, property, human rights, democracy, economic independence, limited and decentralized government, universal education, freedom of enterprise, sound money, and America as a moral example to the world – have well endured throughout the two centuries of our national life. Indeed, many of today’s problems can be traced to our unfortunate habit of abandoning the path he mapped for us two centuries ago. Wow! amazing work. i had a project in social studies about why Thomas Jefferson was important. Have i not gotten an A for this web. thank u and for all Ur help.